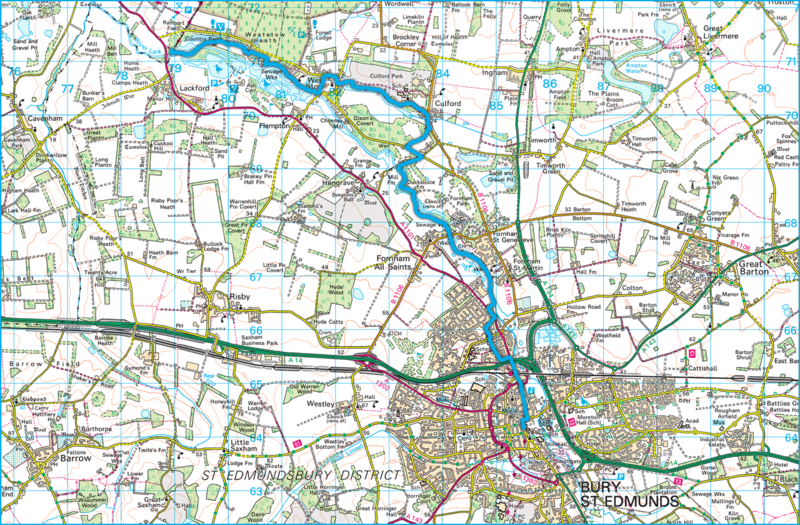 Day Five along the St Edmund Way starts at Bury St Edmunds and follows much of the Lark Valley Path to Lackford. This day can be combined with Day 6 for a massive 22 Mile walk. Spectacular history to explore on a lovely sunny day. St Saviours Hospital ruins next to Tesco and directly on the route. A passing of the busy A14 with the Sugar Factory behind. Smoke from the factory but finally into the countryside. Fornham on ther other side of the river Lark. Pillbox in the golf course. Signs of the Locks that once ran along the River Lark. This one is reported to be one of the best preserved. Still going through the Golf Course. Ruined church in Fornham Park. The church at Culford School. The Spectacular Culford Hall - Now a private School. Following the lake to the Iron Bridge. Probably greatly overlooked but this bridge is something special... It is the oldest Iron Tubular Bridge in the world! Protected by a Grade 1 Listing. A short detour to view the breathtaking West Stow Hall and its beautiful gatehouse. The lake at the end of the days walking at Lackford.